Get off at the JR Yosa Line Matsuyama Station, 15 minutes by taxi, 5 minutes walking from the Street Car Dogonsen Station End Point.It is 20 minutes by car from Matsuyama IC. ※Guests coming by car or motorcycle will charge a separate parking fee (500 yen / 1 unit). Kobe Awaji Naruto Road to Takamatsu Expressway. Kawanoe JCT enter Matsuyama Expressway, get off the Matsuyama IC. Sanyo Expressway, pass through Seto Chuo Expressway to Takamatsu Expressway. Haneda (Tokyo) Chubu ( Nagoya ) Komaki (Nagoya) Kansai (Osaka) Itami (Osaka) Fukuoka (Fukuoka) Kumamoto (Kumamoto) Kagoshima (Kagoshima) There are direct flights from Naha (Okinawa) to Matsuyama Airport. ※For the latest information, flight information etc. 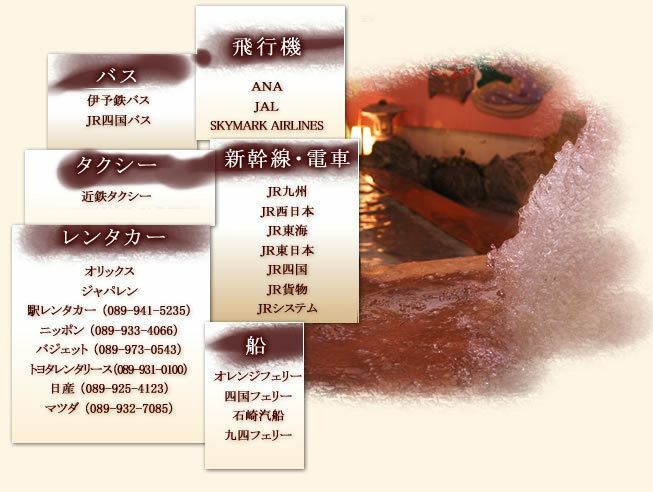 please visit the website of airlines. Honshu - Kyushu direction by Shinkansen to Okayama station. Change to Limited Express and get off at JR Matsuyama Station. ※For the latest information, time and connecting information etc, please visit the website of each railway company. From Kure / Hiroshima / Ogura / Oita / Kobe / Osaka There is a flight to Matsuyama Tourist Port by ferry. ※For the latest information, time etc., please visit each shipping company site.